We start our 20th anniversary year with version 15 in 2015. Pretty Good Solitaire version 15.0 for Windows is available for download from http://www.goodsol.com/download.html . Version 15.0 adds 10 new games, for a total of 860 games. In addition, 2 card sets that were previously extra downloads are now included in the standard install: The Royal Card Set and the Science Fiction Card Set. - Barcelona - a variation of Catalan, a Baker's Dozen type game. - Double Alaska - a two deck version of Alaska, a Yukon type game. - Klondike Twice - a two deck version of Klondike. - Middle Gate - a game in between the games Gate and Little Gate in difficulty. - Mutual Acquaintance - a two deck version of Acquaintance with Ace foundations and King foundations. - Napoleon's Folly - a Forty Thieves variation with building by any suit but the same. - Par 3 - a three deck version of the classic game Golf. - Quadruple Scorpion - a four deck version of Scorpion. - Rank FreeCell - a new FreeCell variation with foundations as in the games Foursome and Quartet - cards are removed by rank. - The Ides of March - a variations of Seventeens with pairing of cards with ranks that add to 15. A full list of all of the 860 games in version 15.0 is at http://www.goodsol.com/pgs . 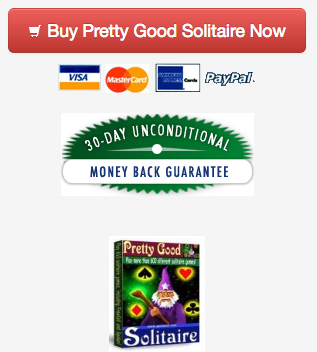 You can download Pretty Good Solitaire from http://www.goodsol.com/download.html . Or, if you have a previous version installed, you can run the game, go to the Internet menu, and select "Download Latest Version". Be sure to exit the game before you install. Version 15.0 is a free upgrade for users who originally ordered version 13 (ordered since April 12, 2011) or have paid for an upgrade since that time. It is not a free upgrade for users who originally ordered version 12 or below. Users of older versions can upgrade for $11.95 at http://www.goodsol.com/upgrade.html . The quick way to determine whether you need to upgrade to use version 15.0 is to look at your registration code. If your registration code starts with "43", "42", "2a", "2r", or "2g", the upgrade is free and your registration code will work in version 15. If your code worked in version 14, it will work in version 15. 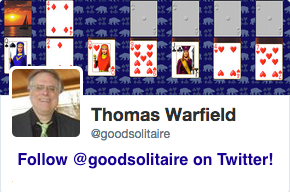 A new version of Pretty Good Solitaire for Mac is coming soon! This game is at Mutual Acquaintance.